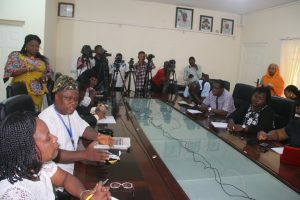 Director General of National Automotive Design and Development Council, (NADDC), Mr. Jelani Aliyu, MFR, Tuesday March 26, 2019 hosted a Press Conference with the mass media at the Council’s Corporate Headquarters in Abuja. The seminar is scheduled to hold in the Congress Hall of Transcorp Hilton, Abuja on Thursday March 28, 2019 with participants drawn from automotive industry stakeholders and relevant agencies including vehicle assemblers, original equipment manufacturers, components makers, Raw Materials Research and Development Council, Small and Medium Enterprises Development Agency, Bank of Industry, Nigerian Customs Service, Central Bank of Nigeria, Federal Ministry of Finance, Federal Ministry of Industry, Trade and Investment, among others. Mr. Jelani Aliyu emphasised that there was need to develop Nigeria’s industrial base so that the country could have capacity to produce locally much of what it consumed rather than relying wholly on importation. He stated that the primary objective of the Nigerian Automotive Industry Development Plan (NAIDP) was to discourage massive importation of vehicles and stimulate local production of automotive products generally. 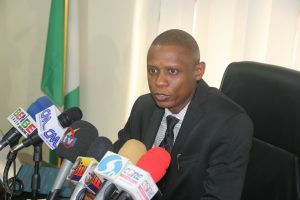 Reacting to criticisms in some quarters that the auto policy has led to huge reduction in vehicle imports and downturn in import duties, Mr. Jelani Aliyu remarked Nigeria, with a very large population, cannot continue to afford the luxury of running an import dependent economy while her citizens roam about without jobs. He added that major manufacturers of global brands of vehicles and original equipment manufacturers were being invited to setup production plants in Nigeria towards making Nigeria a major vehicle manufacturing hub for Africa. The NADDC boss announced that, within the next few months, the Council would roll out a nationwide affordable vehicle purchase credit scheme, at single digit interest rate, spread over a period of about four years, as an initiative to boost patronage of locally produced automobiles. He explained that the scheme would make purchase of new vehicles affordable to numerous Nigerians, as they would be required to make about ten percent down payment while the balance would be spread over a long period of time.